A curfew-like situation prevails in Gahad village of Pauri district these days. A group of leopards has become active in the village, affecting the normal life of local people. Gahad residents claim to have sighted four leopards in their habitat area in recent days. Very recently one leopard attacked a woman and angry villagers launched a charge on the feline. The leopard was found dead under suspicious circumstances near Gahad on 12 June. The jungle cat possibly lost its life in the human attack. In a dramatic event, another leopard was trapped in a cage fixed by the forest department. But even this failed to end fear as another jungle cat become active in the affected area to terrorise the local people. 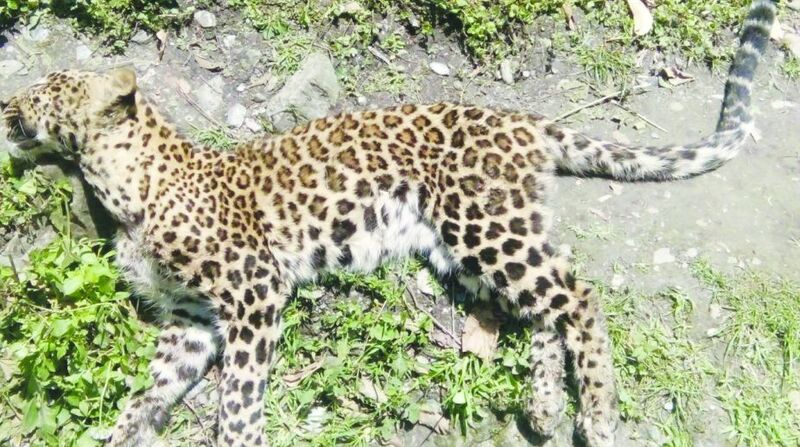 The third leopard killed a cow on 14 June creating panic in the village. The villagers are not able to move freely and lock themselves in as the sun sets. Gahad village in Pauri district has been facing the fear of leopards for a long time. The forest department was forced to fix a cage in the affected village after a feline attacked Mamta Devi and injured her this month. According to reports, the lady shouted for help and villagers attacked the feline with sticks and stones. The leopard was found dead at some distance. Due to movement of leopards, forest department teams have started conducting patrols in the affected village. Gahad, located near Srinagar on the Badrinath highway, is home to 37 families.